I love the different themes/ideas. My favorite is the Christmas patterns. Hard to narrow it down, but if I have to pick it would be Pretty Posies using scraps. I love how you have designed these quilts. So fun. I am partial to the Christmas one. I am already a follower :-) Thanks for this great giveaway! What a fabulous book. my favourites are the green and the pink ones. Love the dots and the stars with 16 scraps. I love the stars and stripes! They are all excellent! I'll go for Stars and Stripes. I follow you on FB and posted a comment there also. This looks like a really fun book. My favorite is Lotsa Dots, but they are all really cute. I already am a follower and I just found you on facebook. So glad to be there. Pick me, pick me!! I'm loving the Christmas one (both ways!) The second favorite would be Stars and Stripes (both ways). 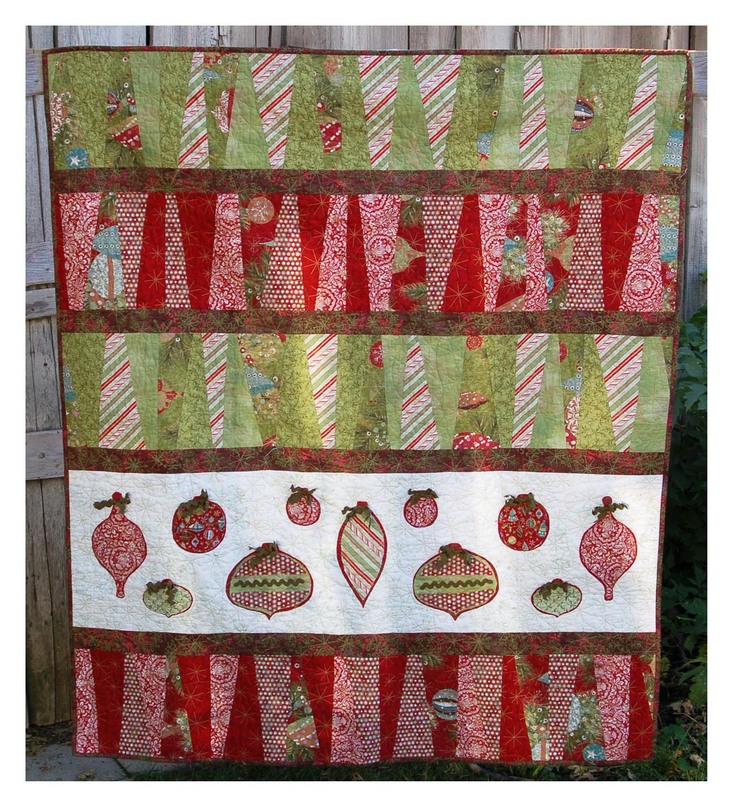 My favorite is the Holiday Hoopla quilt. Thanks! I'm a new follower. Thank you! My favorite is SPooky ALley by far. I already am a friend on facebook!! I love the colourful Spook Alley. I am a follower already, does that count?? Hopefully. I love your patterns, I have several already. Holiday Hoopla is my favorite, the one made with fat quarters, not the scrappy one. This is a really fun quilt to use different theme fabrics. I really like the colours used in Spook Alley. Spook Alley is my favorite! I can't decide if I like it better with eight fat quarters or sixteen scraps, though. They're both so much fun! Holiday Hoopla is my favorite. I added you on facebook. Thanks for a chance to win. I'm not usually a big Halloween decorating person...but I like the Spook Alley quilt a whole lot. I am already a BIG fan of your quilts and bags....have made oodles of the patterns and love them all. I think there are more in my future!!! I think my favorite is the 1st stars & stripes quilt with the 8 fat quarters. I say the Pretty Posies are fun!! Thats my choice. They are all cool! But Im a flower chic! Im added as a follower also! Ooohhh... Love the Stars & Strips with 8 fat quarters... of course they are all good. I'm a follower now too!!! Yea! I love the different themes. I think my favourite one is PRETTY POSIES with 16 scrap pieces. Holiday Hoopla with 8! Although I love the Pretty Posies too. Thanks for hosting such a lovely giveaway. I'm keeping my fingers crossed. my TWO favorites are the STARS AND STRIPES with 8 fat quarters and the SPOOK ALLEY with 8 fat quarters. I love them both oodles! I really like the Spook Alley quilt. I'm already a friend on facebook, that's how I found out about the giveaway!! I cannot believe how beautiful they are. Sheer genius!!! I can't decide between Fun, Fast, and Flirty and Pretty Posies. Do I REALLY have to choose one? ps- thanks for the generous giveaway. 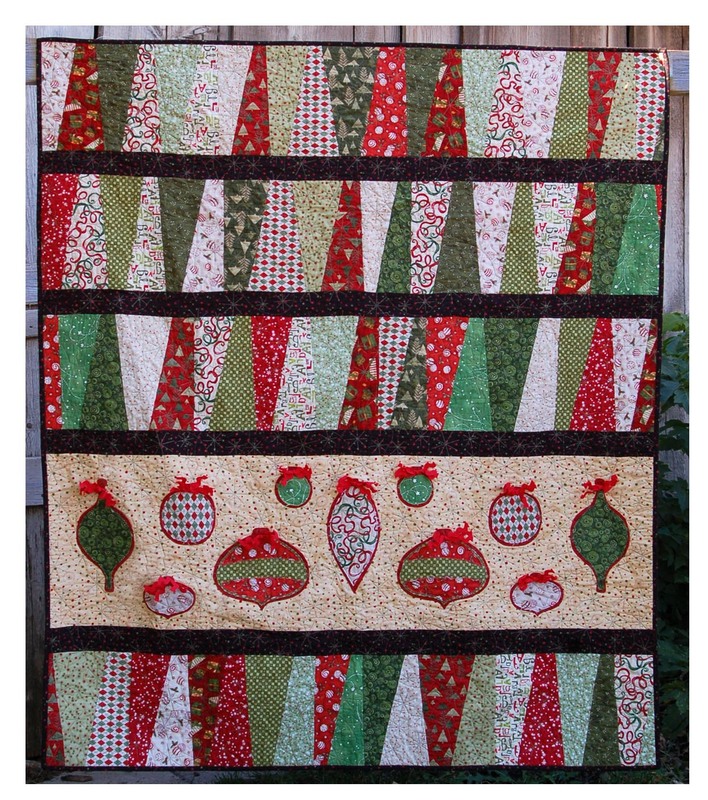 Wow, I all of the quilts are so beautiful, but I must say that "Holiday Hoopla" is my favorite! These are a very fresh idea for decorating for the year! Thanks for the opportunity to win this book! 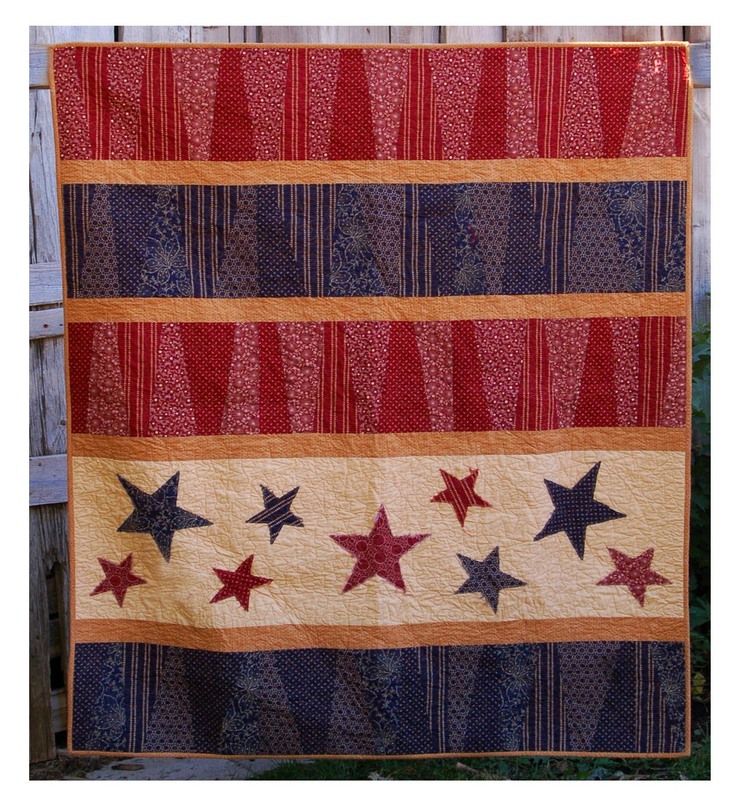 All the quilts are so adorable, but I love the Stars and Stripes quilt using 8 fat quarters. I am a follower on your blog and 'love' you on Facebook! I like the Lotsa Dots quilt and the Stars and Stripes quilt best. 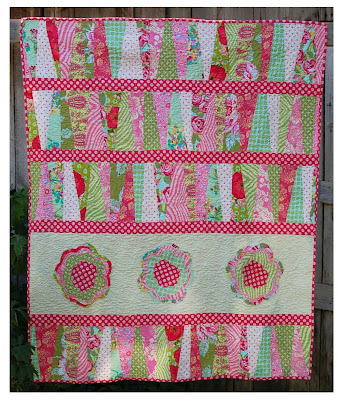 I follow Abbey Lane Quilts. 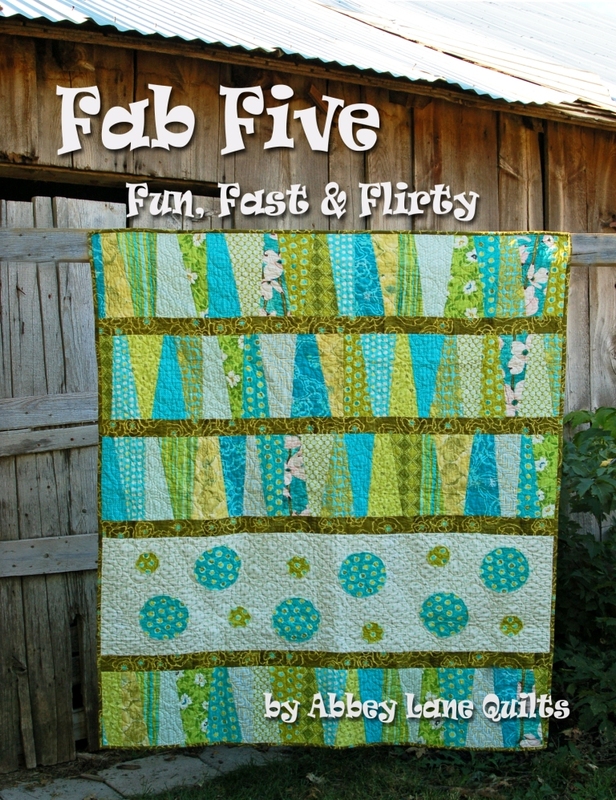 I added Abbey Lane Quilts as a friend on FB. What a versatile pattern. My fav is the Holiday Hoopla using scrap pieces. I signed up to follow your blog. My quilting blogs are keeping me quite busy. Also sent a friend request through facebook. I love the new designs but both versions of Spooky Alley had me at hello! My favorite is Pretty Posies with the 8 fat quarters ... second favorite is Pretty Posies with the scraps! My favorite if the Holiday Hoopla, because I love that fabric line. I love all of your patterns, I think out of these I like the Christmas and Halloween and Flower ones the best LOL. I'm a huge fan of the Christmas ornaments, so even though I loved them all, the Christmas patterns would be my favorite. I love both holiday hoopla and spook alley. I love the Pretty Posies scrappy style. Very cute! I love the Stars and Stripes with 8 fat quarters! It's absolutely stunning. I'm already a your follower. I like the summer Stars and Stripes. There is something appealing about red / navy and cream. I am a humble follower. My favorites are your spring version and of course the Holiday versions! Quilts are a must have for the long and cold nights! They all look fun but I think Spooky Alley is my favourite! I love the Spook Alley with 16 Scraps - it is adorable!! I keep wanting to make a Halloween quilt and this is perfect! Pretty Posies with 16 scrap fabrics caught my eye immediately!! Thanks for the chance to win your wonderful book! My fav is lotsa dots! So fun. Holiday Hoopla is my favorite but they are all so pretty! What an awesome giveaway! I've been a follower for a while now and enjoying it! Just sent in my request to be a friend on Facebook! I really like the lotsa dots. I love the panel of circles with all the off kilter vertical motifs in the other sections. Plus I am always a sucker for circles! I would pick Pretty Posies with 8 fat quarters...but what I like is the versatility. Thanks! My favorite is Holiday Hoopla! Thanks for the chance to win! 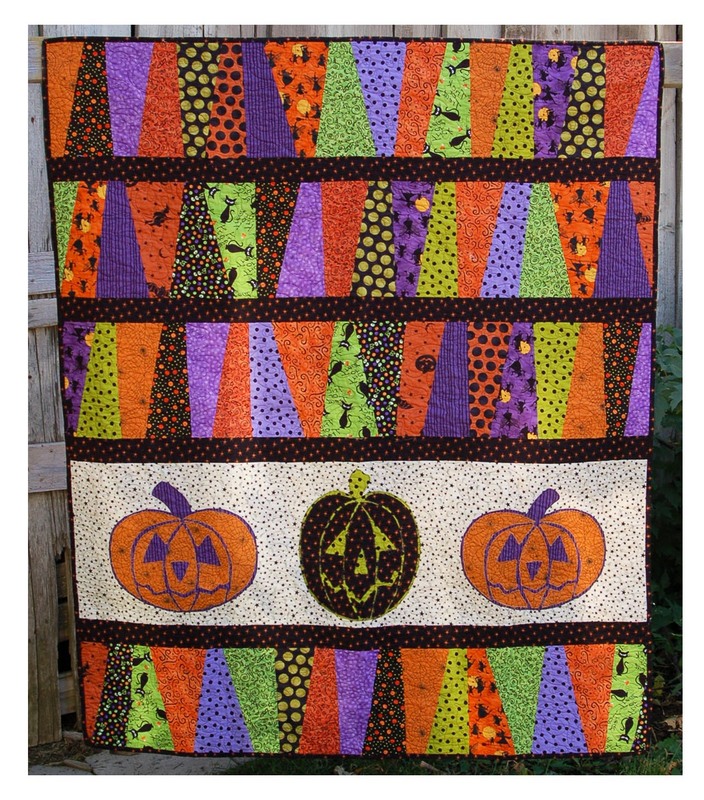 I love the halloween quilt in purple and green and orange. It pops with character! Awesome! I think I love the Pretty Posies with the scraps! Great idea! I'm a friend on Facebook and love getting your updates! I'm a new follower! I'm excited to see where you lead! So cute, I love the bright green one on the cover! Would love to see the book! I like the cover quilt with the circles. I like the one with lots of Dots! What fun, quick and easy quilts. They are all smashing. I like the first patriotic quilt. I think it would make a great "Quilts of Valor" for fallen soldiers. I am a new friend on facebook and I'm headed over to your website to look around. 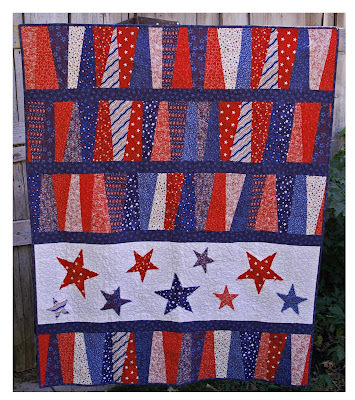 Love the Stars and Stripes made with the 8 fabrics! I love all quilts but the Pretty Posies are wonderful, I love pink !! The cover's quilt is soooo pretty too. I need to use my scraps. Congratulations on your new book. All the designs are really cute. I may be in the holiday spirit, but I love Holiday Hoopla. Oh I so love them all, you are such talented women - thank you for sharing those talents with us in a beautiful book, how exciting!!! Now for my top two very favorites #1 is STARS AND STRIPES with 8 fat quarters what a beautiful tribute to our country and our soldiers. 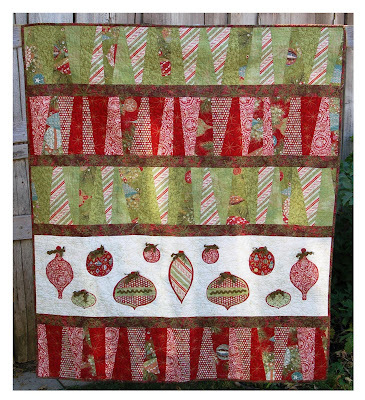 #2 Holiday Hoopla with 8 fat quarters - but really all of them are just darling. Ooh, these look fun! My favorite is the Stars and Stripes! 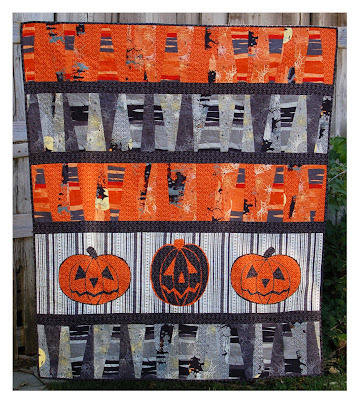 I'm not usually into Halloween quilts, but the Spook Alley with 8 FQ's really caught my eye. I've been happily following for a long time now. I've been a facebook fan for quite some time. Congrats on the book! My favorite is Spook Alley with 16 scraps and I have all the fabrics to use too! 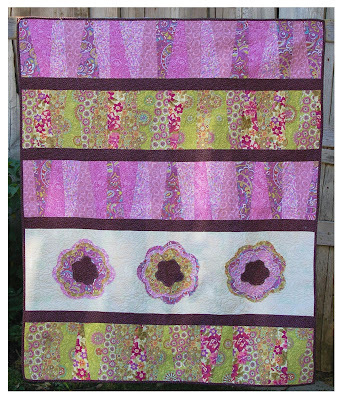 I am a follower of Abbey Lane Quilts! I "like" Abbey Lane Quilts on Facebook! Hi Janice! What a fun book, those quilts look like a lot of fun to make. 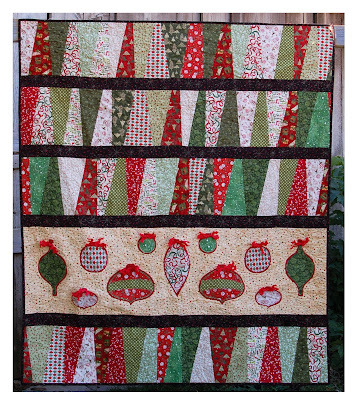 I was just thinking I needed a Christmas quilt so I love the Christmas one the best! The Spring Pretty Posies are the cutest ever! I can't wait to get this book! My favorite is Stars and Stripes with the 16 scrap pieces! I'm already your friend! (on FB) LOL! I like the stars and stripes with 8 fqs. Those are such cute ideas! I like Pretty Posies in pink/green! Thank you for the giveaway! I like the pink one with flowers, but my 3-year-old who is sitting on my lap as I type votes for the Halloween one! I really love the Halloween and Christmas quilts. The whole book looks super. I have been following your blog for about 6 months and really enjoy it. Oh, they are all fantastic quilts! I think pretty posies is my fave. pretty posies is my favorite. I just sent a request to "be your friend" on facebook. i like the stars and strips - very nice! I'm already a follower and I have two favorites.....the Spooky Alley from scraps and the Stars & Stripes from fat quarters. Yummy!! While I love the Christmas quilts, my favorite is Pretty Posies done with 16 scraps. Great idea for a book! I love the quilt on the cover. thanks for the chance to win! I like the Stars and Stripes using scraps. Thanks for the chance to win! I love them all but if push comes to shove I guess I like the Halloween ones the most. All the quilts almost look like they have a secret message written in them. You know when they stretch the letters and make them taller? They look like that. 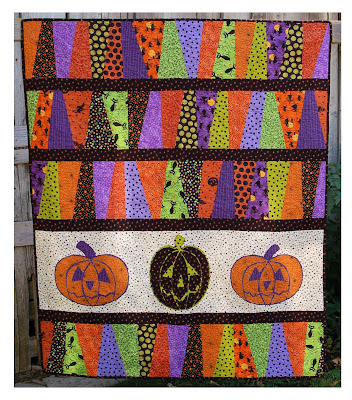 So many variations - I like the Spooky Alley Halloween quilt with the 16 scraps - so many purples and oranges. Thank you for the giveaway. I like them all!! 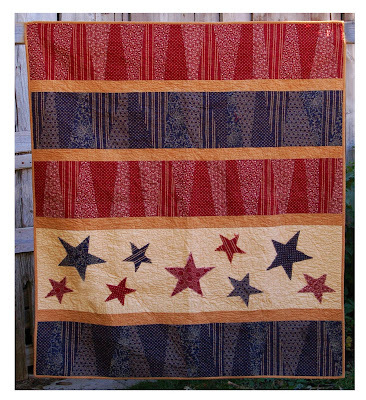 It's hard to choose, since you've selected all my favorite themes/colors... but since I don't see many Patriotic quilts, I'm going to say the scrappy patriotic one. I'm already a FB friend. That's how I learned of your giveaway. Thanks for accepting my friend request. I love the stars and stripes. What a great book! I love them all but my fav is the brightly colored halloween quilt! I absolutely LOVE the Stars and Stripes quilts! If I had to choose, it would be the scrappy one, but it's really, really close! I am a follower and a facebook friend! This books looks great. WHat wonderful quilts to use up scraps. I think I like the spook ally the best (I did buy a fat quarter pack of all different Halloween fabrics and then didn't know what to make with it). I love the ruffles and roses pillow. I have a quilt made with yoyo's on and I could use the yoyo's on some matching pillows. I love the ruffles and flowers, as I just finished a quilt with yoyo's on and I could make some matching pillows with the yoyo's on to match. They are all cool, but Block Party is my favorite pillow! I am a friend already on facebook!